Waterfall photo, Wrangell St. Elias National Park, Alaska. Waterfall, Wrangell - St. Elias National Park and Preserve, Alaska. From a recent trip to Wrangell – St. Elias National Park; we spent a few days down in the low country before hitting the alpine regions, and I took advantage of the high overcast skies to shoot a few waterfall images. This one was quite a mission to reach, including a march through a marshy boggy, swampy mess of a forest, but well worth the effort. Spending most of the summer up above tree country I don’t get a lot of work on these kinds of shots; the waterfalls there tend to be a little less than some of the bigger snowmelt runoff falls down lower, so I was glad to get this opportunity. We also saw a number of black bears, beaver, porcupines, golden eagles, Dall sheep and mountain goats on our trip, and then were lucky enough to see a moose cow with her 2 calves in the forest on our way home. Good times! 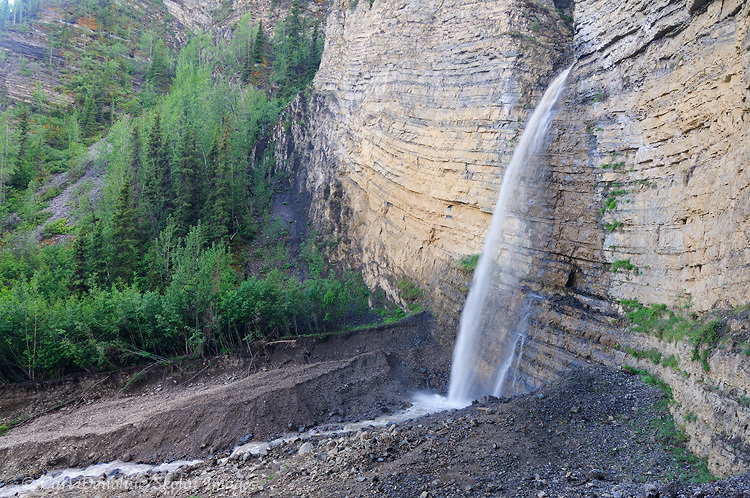 This entry was posted in Alaska, Landscapes, Wrangell - St. Elias National Park and tagged Waterfalls on June 29, 2011 by Carl D.